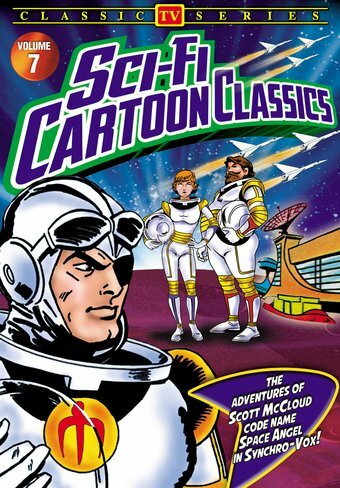 Ace astronaut Scott McCloud, code-named "Space Angel", battles intergalactic threats in four lost episodes of this animated TV classic. Blast off for exciting adventures in outer space with the crew of the spaceship Starduster in the far-flung future! Ace pilot Scott McCloud (codename: Space Angel), communications expert Crystal Mace and flight engineer Taurus patrol the galaxy for the Interplanetary Space Force, keeping the Earth safe from any and all threats! Space Angel was the second series produced by the short-lived Cambria Productions, who had previously made the Syncro-Vox animation method famous with Clutch Cargo (1959-1960). Like Clutch, the series used the cost-cutting technique of filming voice actors as they delivered dialog, and then superimposing their lips over still drawings of the characters' faces. Ned Lefebver was the voice of Scott McCloud, while Margaret Kerry (the model for Tinker Bell in Peter Pan) played Crystal. Hal Smith, best remembered as Otis on The Andy Griffith Show, voiced Taurus, the Scottish engineer, a precursor to Star Trek's Scotty. Animation and comics legend Alex Toth (1928-2006) created the majority of the artwork as large storyboards, to which the limited Syncro-Vox technique was then added. Beginning his career as teenager in the 1940s drawing "The Flash" and "Green Lantern" for DC Comics, Space Angel was Toth's breakthrough in the animation industry. He would subsequently become chief character designer on such staples of Saturday morning TV as Space Ghost (1966-1968), Birdman and the Galaxy Trio, The Herculoids (both 1967-1969) and Super Friends (1973-1985). His influence is still seen today in series like Batman: The Animated Series and The Venture Brothers. Space Angel used the same eerie stock music score composed by William Loose and Fred Steiner that was featured in films such as Teenagers from Outer Space, The Killer Shrews (both 1959), and, most famously, Night of the Living Dead (1968). THE LITTLE PEOPLE: Space Angel becomes embroiled in a war waged by strange, gnome-like aliens. THE WIZARD OF EDEN: The Starduster lands on a planet that resembles the Garden of Eden, but not everything is what it seems. THE SAUCER CAPER: Crooks steal a fully-functional flying saucer built by whiz kid inventor Johnny Kendall. DEATH OF A GALAXY: When two worlds collide, Scott and his crew must outrace the tremendous resulting shock wave.